LAFAYETTE — A commitment made to Indiana 30 years ago, is still producing a return on investment. The year was 1989 when the new Subaru-Isuzu Automotive plant opened in Tippecanoe County. Since then thousands of Hoosier workers have made countless models of cars. Today, the place has a different name but Subaru of Indiana Automotive in Lafayette is still hiring hundreds of workers and weeding through those who really want to turn a temporary job into a permanent career. Dorothy Moore works on the second shift in stamping, which she describes as the second part of the manufacturing process of building a car. Moore has worked at the plant for nearly 3 years operating heavy machinery, like cranes. For her, it is quite the change from baking cakes and cookies for a living. "It didn't really pay very well," Moore said. "And so, a lot of friends that worked at SIA said, 'Hey they're hiring, come work for SIA. They have wonderful pay and benefits. You won't be sorry.' And I'm not. I'm glad I'm here." Managers at SIA want more workers with Moore's kind of attitude. Scott Brand, SIA's senior vice president of quality and administration, said the company wants to fill more than 125 positions, mainly on the assembly line. The new workers would set car parts into place as they are moved along the line. Subaru hires workers through a temp agency, CTI Personnel, with wages starting at $14.25 per hour. Raises are worked in every six months. Those positions eventually lead to full-time employment with Subaru itself. "First and foremost, we need people that will come to work everyday," Brand said. "We have some turnover just based on people not being willing to get up in the morning or being able to make it to work in the afternoon at 4:30." Brand admits there is a challenge nowadays retaining workers — attributed to a growing, generational apathy among laborers. It's a trend with which other employers are also grappling. 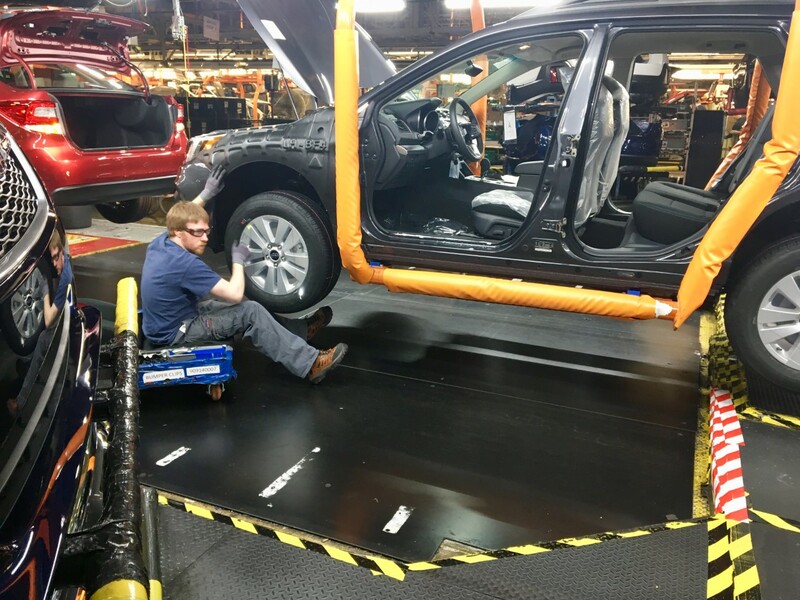 Brand is hoping veteran workers, who have tenure at the Subaru plant will help younger associates and new hires see assembly line work produces good jobs. "And they should, by applying themselves and coming to work everyday, have a great opportunity to have a good life and a good career here at the company," Brand said. The company offers incentives to get workers to keep coming back — competitive wages, a perfect attendance bonus, a fitness center, and a child development center with child care. There are roughly 5,700 employees who work at the SIA plant. Half live in Lafayette. The other half come in from surrounding counties in metro Indianapolis. Subaru is also exploring options to ease transportation challenges for workers with a longer commute. With a growing workforce, the plant is expanding its training facility to get more workers on the production line, faster. For Moore, the potential for so many new hires translates to a growing family for her. "We spend more time with these people than we do our own family and friends," Moore said. "So we make the best of it. And we get along really well."